As an U.S. Air Force Cop (AP/SP/SF) we all have a unique bond. It is the "Bond of the Blue Beret". We all have protected America's personnel and resources. This bond was forged in many places around the globe, place likes Korea, Vietnam, Thailand, Granda, Panama, Saudi Arabia, Kuwait and the war on terrorism fought in Iraq and Afghanistan. It's a cliche word but is indeed the camaraderie we developed and shared through seat, blood and tears while serving in the United States Air Force as Military Policemen, Air Policemen, Security Policemen & women and Security Forces. We also welcome and honor the service our our Combat Arms Training and Maintenance (CATM) who without them we would not have the training or arms to fight the battles we called to. We not only remember the past, but the USAF Police Alumni Association is constantly looking forward for ways to preserve the proud history and traditions of USAF Cops and to support and honor the men and women who are serving in Security Forces today. We believe that the USAF Police Alumni Association have many great opportunities ahead of us and we are excited that you want to join us in that journey. Our goal is to remember the past and support the future of the Air Force's largest career field! Individual Membership is $25.00 a year. If you register for the annual conference and meeting prior to August 1st of each year, your membership will be included in your conference registration. 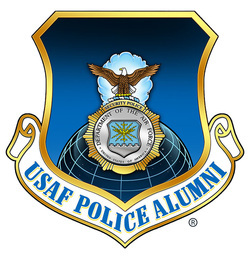 To Join the USAF Police Alumni Association as an Associate Member please register here. Associate Membership is for individuals who have not personally served as a USAF AP, SP, SF or CATM, but support the mission and goals of the USAF Police Alumni Association. Associate Members may be friends, family members and/or colleagues of regular members who wish to support the organization and our mission of preserving history and assisting active duty Security Forces members. Associate Membership is $25.00 annually. If you register for the annual conference and meeting prior to August 1st of each year, your membership will be included in your conference registration.